With these teams sitting first and second in Group B in the Eurocup, both sharing a 3-2 record, top spot is up for grabs and this means we should enjoy a fantastic evening of basketball betting action on Wednesday night. Both of these teams are very likely to make it through to the next round but this game isn’t really about that, it is about asserting their dominance in the group and making a big claim on being the top dog in the tournament. The hosts come into this game looking to avenge a defeat at the hands of Montakit earlier on in the season but they also know that if results go in their favour, they could book their spot in the next round of the tournament. 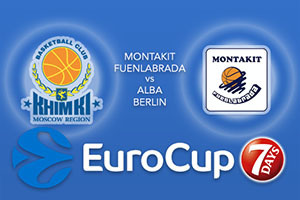 If Khimki Moscow Region win and ALBA Berlin grabs a victory over Bilbao Basket, the hosts will be celebrating a massive night. Khimki have managed an average of 89 points per game this season and have a few players who can deliver big points. Alexey Shved missed a few games at the start of the season but with an average of 20 points per game, he is clearly a big player for the Russians. It is not possible for the away team to book their spot in the next round this midweek but a win will go a long way to clinching their passage. An 89-85 win over Khimki earlier on this season is all the proof that Montakit need to have to know that they can perform against their opponents and with an average of 89.6 points per game so far this season, they also know that they can score points when it matters. Marko Popovic has been an integral player for the away side so far this season, delivering an average of 14.2 points per game and another showing along these lines would be very welcome for the away team. This is a game that could go either way but look to take Khimki Moscow Region at -11.5 which is provided at odds of 1.90. Anyone looking for the Over/Under market should go UNDER 171.5 which is available at odds of 1.90. Bet Now!